It's easy to find storage options for your Christmas tree, lights and wreaths, but what about all of your other seasonal decorations? Your snowman collection, tree skirt, snowflake candle holders and holiday baskets need to be stored away too. Our CoverMates holiday storage duffel bags allow you to safely store and carry your miscellaneous holiday items to keep them ready for next year. 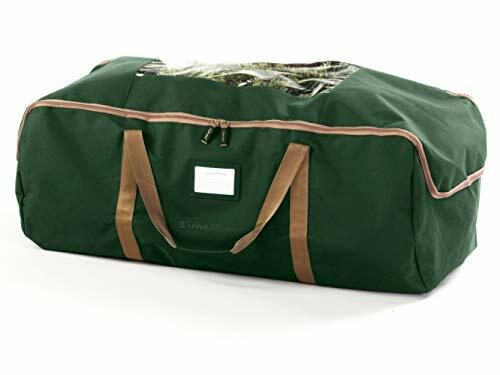 CoverMates holiday storage duffel bags are also a great solution for storing your 3-section Christmas tree set. Simply disassemble the tree and place each segment into its own holiday storage bag for an easier, more lightweight option to storing your Christmas tree. And with the included ID window you can label each bag to keep track of its contents for simple and fast organization. Each bag has reinforced carrying straps and a large double-pull zipper. Like the rest of our Holiday Storage collection, CoverMates Holiday Storage Duffel Bags also come with our industry leading 3-year manufacturer's warranty. Click on the CoverMates or The Cover Store links above to view our full assortment of holiday storage, patio furniture, TV, grill, household and vehicle covers.